Schleich Velociraptor is museum quality replica, hand painted, authenticated model by the paleontologists of the Museum of Natural History. 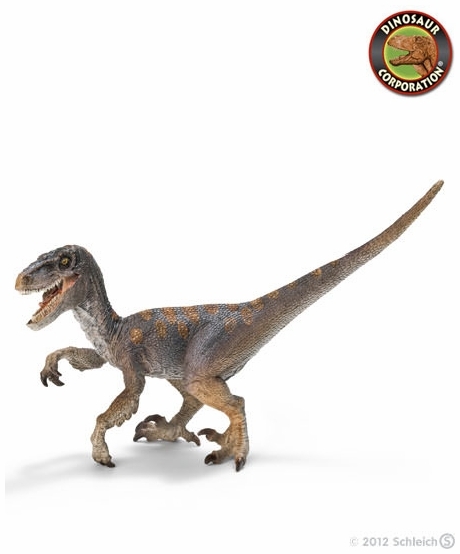 Velociraptor is a great toy gift for dinosaur enthusiasts and serious collectors. Velociraptors were probably very intelligent dinosaurs who hunted in packs. Although they were only 70 centimetres tall, these carnivores could overpower significantly larger prey. These dinosaurs reached speeds of up to 65 km/hour and were able to make quick turns thanks to their stiff tails. To eat their prey, Velociraptors had eighty sharp, curved teeth in their flat snout, some of which were 2.5 cm long.